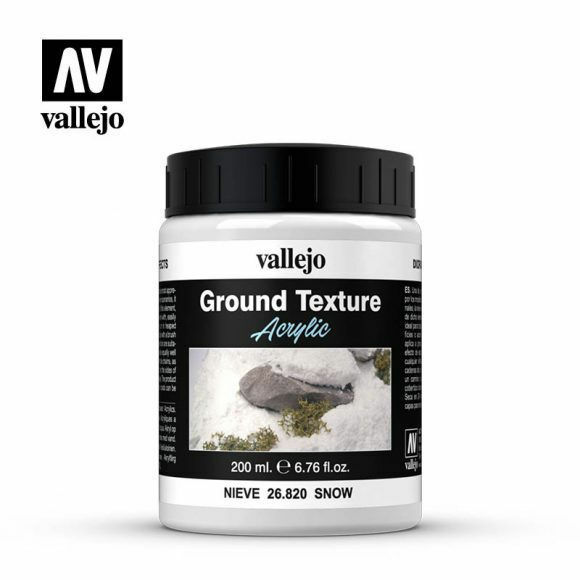 The placement of our model in a diorama or vignette gives it a reality, a background and a history, an added dimension and a reason for the humidity, the traces of mud, of the dry sand of the desert or the dark earth of the wooded landscapes of central Europe. The range of Diorama Effects offers the modeler everything needed for the reproduction of a terrain, with effects of sandy and dusty roads, or of snow, mud and water, all of which add to the realism of the setting and relate the model to its environment. Safety: Diorama Effects is not flammable, and does not contain solvents. Applications: Snow reproduces the glittery look of this element, and is an ideal medium to work with, easily coating all surfaces, evenly or in heaped mounds. The product dries in 24 hours, and further coats can be applied for more volume.